New & Improved 100% PVC Plastic Prestige Playing Cards! FEEL THE DIFFERENCE! PLAY THE DIFFERENCE! 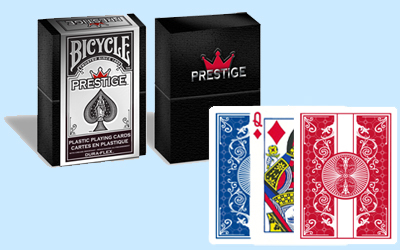 Manufactured in Spain using the finest quality Dura Flex PVC plastic, Prestige Playing Cards feature an air cushion finish for easy shuffling and dealing. The cards are available with blue backs and regular size numbers and pips. Each wide size deck and comes nicely packaged in a durable plastic storage box.